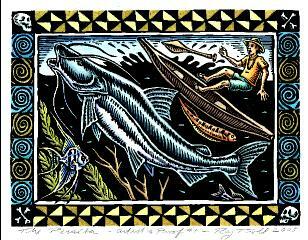 Prairie Ocean: Long Time No Sea – works by Ray Troll of Ketchikan, Alaska, and Chuck Bonner of Scott City, Kansas – through March 16, 2019. At the Birger Sandzén Memorial Gallery in Lindsborg, Kansas. PDF Flyer and Statement by Ray and Chuck for the show. In 1986, Richard Glenn, a 23-year-old geology student from Barrow, spotted an odd shape in a foot-long chunk of rock near Atigun Gorge. It consisted of a series of points arranged in a spiral, like the shell of a snail. It made sense at the time. Glenn’s project involved mapping the convoluted “jelly roll” of geological formations in the Brooks Range. Fossils were part of the evidence he took under consideration, but they were not very helpful when found out of place. This thing, whatever it was, had dropped from its original location onto a steep scree slope of mixed rock. The next day his adviser, Gil Mull, arrived from the University of Alaska Fairbanks and, hearing about the fossil, suggested they take another look. They found it and brought it back to camp. Mull didn’t know what it was either. He forwarded the rock to the Smithsonian Institution, where it was identified as the teeth of a Helicoprion, an extinct predatory fish that lived about 280 million years ago. Glenn noted the name in his master’s thesis, but didn’t see the fossil again. In fact, he couldn’t find out what had happened to it. Now executive vice president of lands and natural resources at Arctic Slope Regional Corp., he said, “I must have gone to Washington, D.C., 20 times in the last 29 years. When I did, I’d go looking for it, asking around the Smithsonian. But no one knew anything. 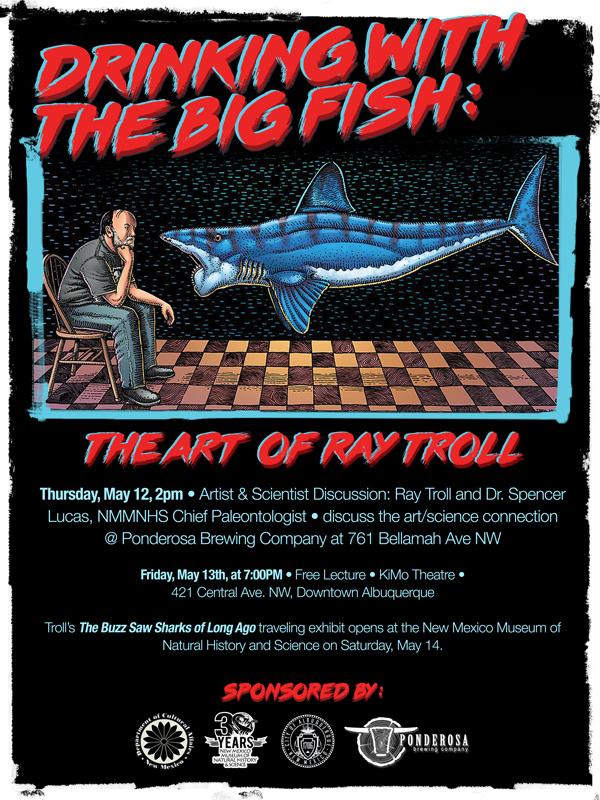 Ketchikan artist and avid fisherman Ray Troll has made an international reputation with his surreal pictures of fish accompanied with quirky titles like “Spawn till you die” and “Fish hard, die free.” He also has a fascination with paleontology. Museums know who he is. They sell his T-shirts and cups in their gift shops. His success as an artist has helped open doors. He gets tours of the back rooms and is on a first-name basis with scientists and curators. In 1993 he visited the collection at the Los Angeles County Museum, where he saw a rock with a weird spiral pattern, “sort of being used as a doorstop,” he said. He thought it was a shellfish and wondered why it was with the fish fossils. Troll’s mind was similarly blown. What was something that looked like a spring doing in the mouth of a major predator? How did it happen? How did it work? 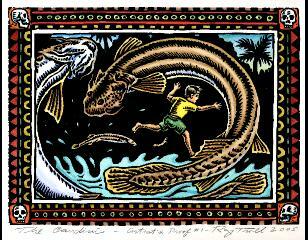 “Staring into the whorl of teeth, I knew my life was forever changed,” he later recalled. He became obsessed with the spiral. 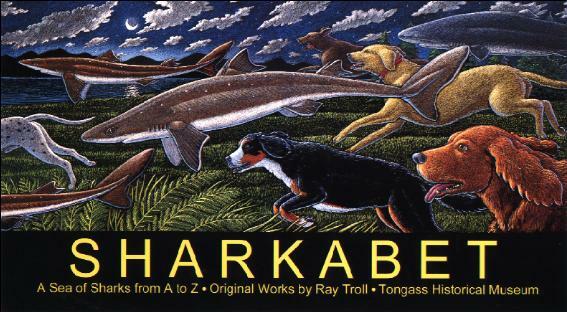 He featured the animal as the “H” entry in his 2002 “Sharkabet” alphabet book. He contacted every Helicoprion expert he could find. There weren’t many and they couldn’t tell him much. Nor were there many specimens, only about 150 collected from around the world, and they consisted only of the teeth. Helicoprion’s skeleton was formed from cartilage, not bone. When it died and decayed, the teeth were generally the only part that lasted long enough to be preserved. From the first discoveries, scientists puzzled over where the teeth went and how they were used. They placed them on the animal’s snout, its tail, its fins. They wondered if they were for defensive purposes, snapping out like a party favor, to use Troll’s analogy. Idaho is the Helicoprion capital of the world, with many fossils found in phosphate mines there. One such whorl found in 1950 had impressions of cartilage from the beast’s head. In recent years a team led by Leif Tapanila put that specimen through a CT scan and teased out clues about where the whorl of teeth fit. In February 2013, they published a paper announcing the results in the scholarly journal Biology Letters. 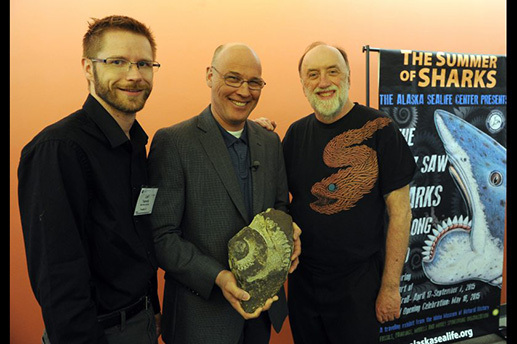 Several members of the Idaho team made presentations at the Geological Society meeting, which took place in UAA’s ConocoPhillips Integrated Science Building from May 11-13. Jesse Pruitt, who worked with the CT scan, pointed out one of the key discoveries: The disc of teeth was held in place by a supporting arm of cartilage that projected upward from the bottom jaw. This kept the older teeth on the bottom of the disc from pushing into the jaw tissue when the fish bit down. 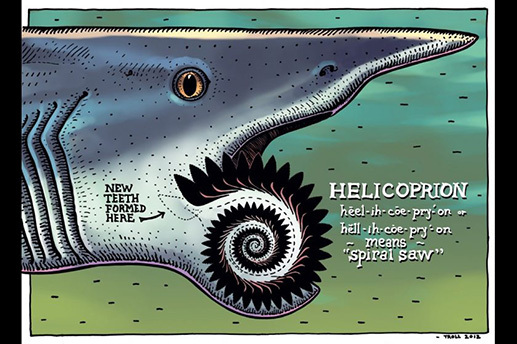 The mechanism resembled a circular chop saw, which has given the Helicoprion its popular nickname, the “buzz saw” shark. Pruitt said the smallest teeth, those toward the center of the spiral, were the animal’s baby teeth. As it grew, new and bigger teeth emerged full size from the direction of the creature’s throat and pushed the older, smaller teeth forward toward the outer lip where they curved downward and formed a coil. Biologist Jason Ramsay said only 11 of the more than 100 teeth in the whorl were functional. The rest were either emerging, full size or had curled away into the jaw. The circular arrangement resembled the arc of an ulu, but instead of a back-and-forth motion, the circle of teeth cut like an ax. The way the jaws opened forced the food farther back in the mouth. Thus each bite not only further mangled the prey but moved it toward the gullet to be swallowed, probably in large chunks. Helicoprions did not chew their food. 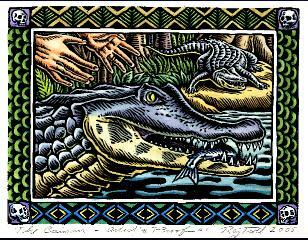 Tapanila said they had tiny teeth on the roofs of their mouths to help hold prey steady as the chomp came down. But what purpose was served by having teeth grow into one’s throat? True sharks, related to but not descended from Helicoprion, grow new teeth throughout their lives but shed the old ones. 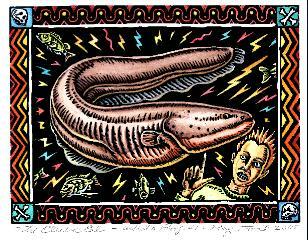 Their teeth, and the teeth of other vertebrates — yours, for instance — each have their own root. 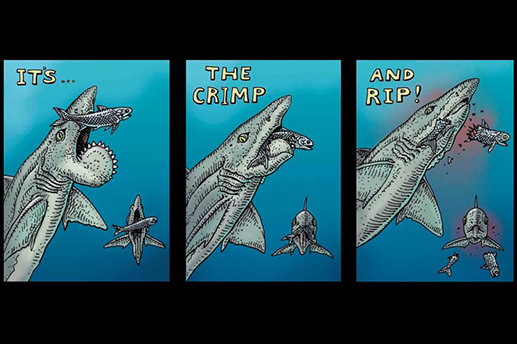 But all of Helicoprion’s teeth were attached to a single, continuous root structure. This may have made the whole biting apparatus stronger. But, as each tooth was an integral part of the same base, they could not be shed one by one. So they had to be stored. The animal needed strong teeth to deliver its lethal bite. 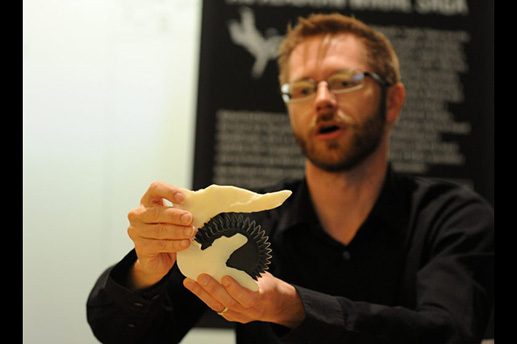 Ramsay ran some numbers to show that the jaw of an average size Helicoprion exerted a force equal about half of the that produced by a junk yard auto crusher. “They could really bite hard,” he observed. How did a warm-water fish wind up in the Arctic mountains? The Brooks Range is formed of seabeds that have been forced upward over time, Glenn said. And the world was warmer in Paleozoic times. Paleobotanist Kirk Johnson mentioned that he’d found impressions of palm tree leaves in the Matanuska Valley the day before and said that for 85 percent of Earth’s history the poles have been ice free. Helicoprion tooth whorls have been found over a wide geographic area. They were clearly a successful species — but an evolutionary dead end. 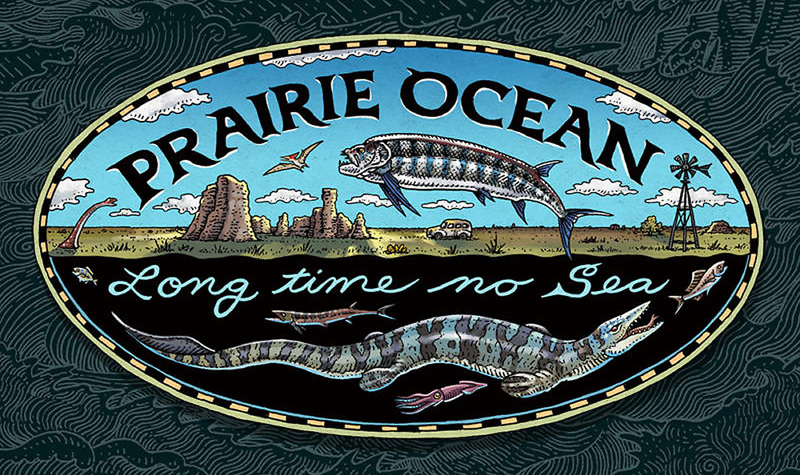 They vanished at the end of the Permian period, about 250 million years ago, in a great “die-off” that sent 90 percent of Earth’s life forms to extinction. Today all sharks and bony animals have teeth in bilateral pairs, if they have them at all. A rodent’s incisors, carnivore’s canines or herbivore’s molars have matching left and right sides. But Helicoprions and other shark-like fish of their time had all their teeth in a single line. The tooth whorl provided a biting mechanism that was solid as rock, could grow with the animal and, in evolutionary terms, solved the space problem by tucking away the outgrown teeth. Physical attributes beneficial to a species, like locomotion and sight, tend to evolve repeatedly in different ways. But nature never tried the buzz saw jaw idea again. 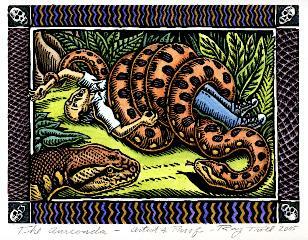 “No other living thing has done this,” Tapanila said. Troll found similarities in the sperm whale, which only has teeth on its narrow bottom jaw and preys on squid similar to what Helicoprion would have hunted. But whale teeth don’t have a single root, and nothing like a wheel of teeth is found among modern animals. Whatever other unique features Helicoprion had may never be known, “unless we find that holy grail specimen we’re all waiting for,” Tapanila said — a fossil that would show the body, fins and perhaps even organs of the animal. Troll’s illustrations were used in Tapanila’s Biology Letters report and the companion article in Scientific American that appeared at the same time. They were also a big part of an exhibit at the Idaho Museum of Natural History in Pocatello that opened June 22, 2013, and has since traveled to Tacoma. 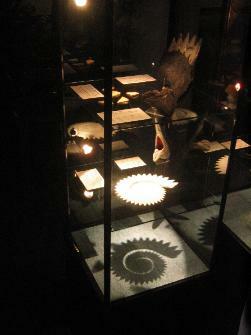 The exhibit included key Helicoprion fossils and a mechanical version of the buzz saw bite. 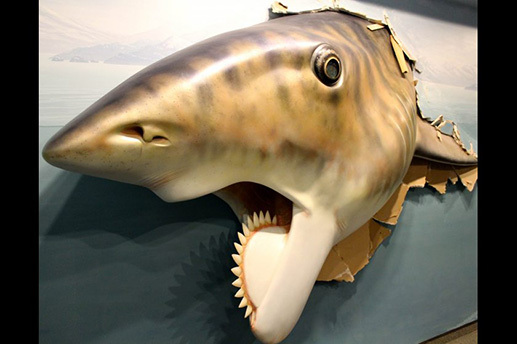 Missouri artist Gary Staab provided models of a complete 15-foot fish and the head of a 30-footer made to appear as if it were crashing through the wall. Wall decorations and even the upholstery on a couch were based on Troll’s paintings, many of which were displayed to describe the place of the Helicoprion in paleontological lore. 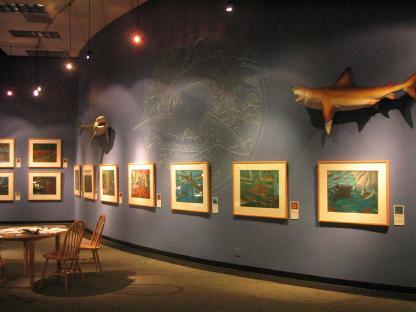 At his urging, the center — best known for its displays of live fish, seabirds and marine mammals — agreed to host the exhibit starting in April 2015. It’s the first traveling show to come to the center since it opened in 1998. 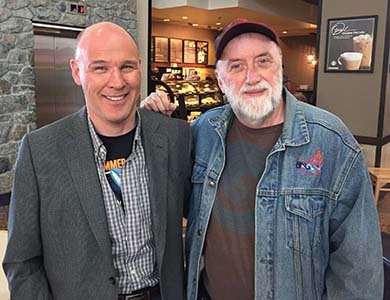 In February of this year, Richard Glenn was a guest speaker at the center. Someone told him about the upcoming show and asked if he knew what a buzz saw shark was. Glenn was familiar with Troll’s work. He’d noted the Helicoprion in the “Sharkabet” book and said the thought had crossed his mind that he might have an ally in trying to locate his Atigun Gorge specimen. Mull, Glenn’s thesis adviser, now living in the Lower 48, couldn’t remember where he put the film he shot of the rock in 1986. 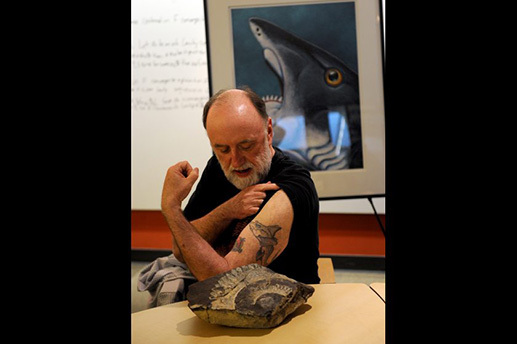 J. Thomas Dutro Sr, the man who had identified it as a helicoprion had died in 2010. The labyrinthine vaults of the Smithsonian’s National Museum of Natural History contained no easy-to-find records indicating it had ever been received. Troll started making calls and his buddies in the museum world swung into action. “Ray has more clout at the Smithsonian than I do,” Glenn said. The museum’s collection manager, David Bohaska, began opening drawers, all of them. “Drawers that didn’t say ‘Alaska’ or ‘fossils’ or anything,” Troll said. After a month of searching, Bohaska found the mislabeled rock from Atigun Gorge. “I knew it had to be part of the exhibit in Alaska,” Troll said. But would the Smithsonian loan such a rare fossil? This summer Glenn’s buzz saw shark tooth whorl is on display at the center’s “Summer of Sharks” exhibit. Viewers will see most of the Idaho exhibit with a few tweaks that add information discovered since 2013. There’s an eye-opening video of Troll trying out a metal version of a whorl set on a lever handle. Troll and crew gleefully work it on a variety of things, decapitating fish, chopping carrots, dividing cantaloupe, a tube of toothpaste and a can of Diet Coke. “It’s a really efficient slicing machine,” Pruitt said. 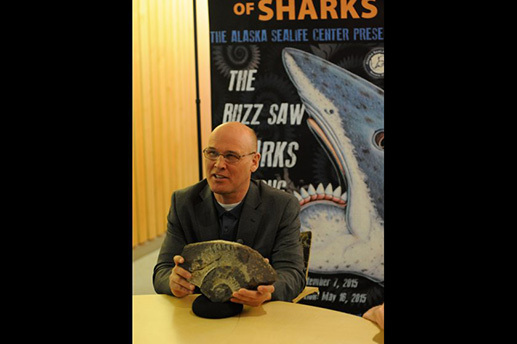 Troll talked about his upcoming book of West Coast fossils, written with paleobotanist Johnson, in which he had to go back and insert an illustration of a Helicoprion in Alaska after learning about the Atigun fossil. “Is Richard Glenn here?” Troll asked. Glenn nodded from his seat in the second row and Troll left the lectern to shake his hand. They had spoken on the phone before, but never met in person. 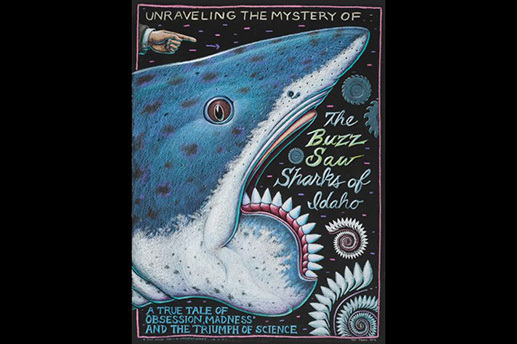 Now through the summer of 2019, the Buzzsaw Sharks of Idaho Show is at the Idaho Museum of Natural History at Idaho State University in Pocatello, Idaho. Our Buzzsaw Shark exhibit has traveled the country, delighting audiences exceeding over 500,000 people. We’re excited to bring this one-of-a-kind attraction back to Pocatello, literally where it all began. The Buzzsaw shark–Idaho’s weirdest fossil–swam the ancient ocean that once covered our state eons ago. This whorl-toothed shark occupied the seas 270 million years ago. Now, Idaho’s Buzzsaw Shark is coming home to Pocatello and will be the featured exhibit at the IMNH. The exhibit artfully puts the Helicoprion shark on display. Its fossils fascinate both paleontologists and exhibit visitors alike. This exhibit will run through the summer of 2019. This exhibit is proudly sponsored by J.R. Simplot. Shark week is every week in Idaho this year! The Idaho Museum of Natural History on the ISU campus in Pocatello opened a major new exhibit based on a giant prehistoric shark found in the phosphate mines of Idaho. 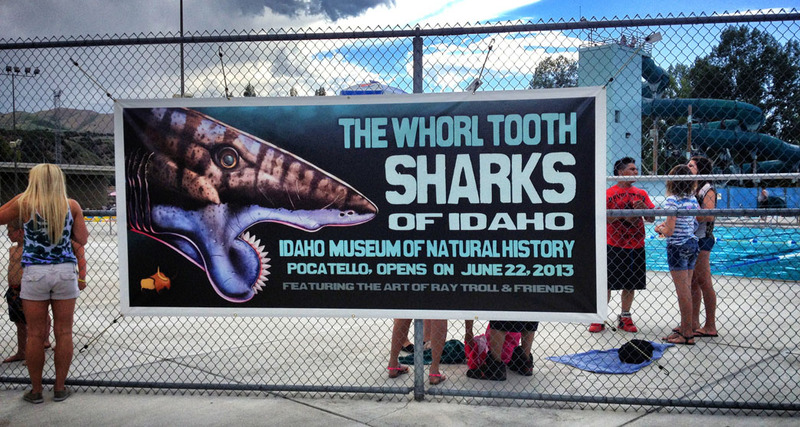 “The Whorl Tooth Sharks of Idaho” opened on June 22 2013, and runs through the end of the year. 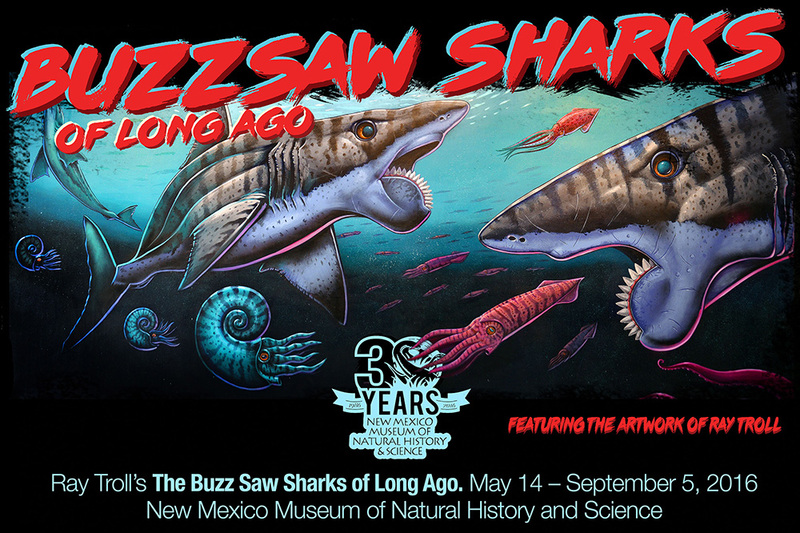 The exhibit features a wide array of fossils of the 270-million-year-old shark called Helicoprion, along with original artworks by Alaskan artist Ray Troll, life-sized sculptures of the shark bursting through the museum walls by sculptor Gary Staab, original music, a short documentary and much more. There are children’s activities too, so it promises to be fun for the whole family. The exhibit is a unique combination of science, art, music and humor. 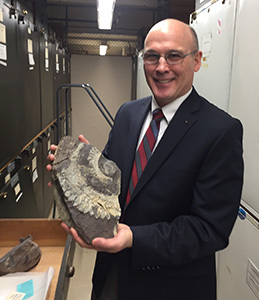 “The fossils are spiraling coils of razor-sharp shark teeth and are beautiful things just to look at,” said Leif Tapanila, ISU associate professor of geosciences and IMNH earth sciences curator. Opening day activities on June 22 include a slideshow by Troll and Tapanila at 2 p.m., guided tours of the exhibit from 3 to 4 p.m., and a book and T-shirt signing by Troll. 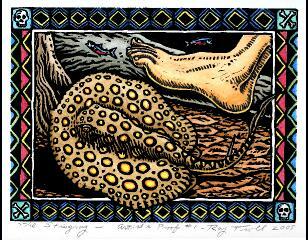 The shark has intrigued many people over the last few decades and Ray Troll is probably the ancient shark’s biggest fan, according to Tapanila. “I started working with the ISU crew a few years ago when an undergraduate student named Jesse Pruitt contacted me wanting to know more about the shark,” said Troll.Pruitt’s query reignited Troll’s passion for the shark. As the new research progressed Troll was an active participant in the work revising versions of the shark’s appearance as the work progressed. Illustrations featured in the new exhibit show the progression of art and science, and many of the fossils are being displayed for the first time. This exhibit is made possible by the Anne Staton Voilleque Charitable Foundation, The William J & Shirley A Maeck Family Foundation, the Hitz Foundation, and The Monsanto Fund. The Idaho Museum of Natural History is open Tuesday through Saturday, 11 a.m.-5 p.m. Entry is $5 adults and $1 children pre-K to grade 12. 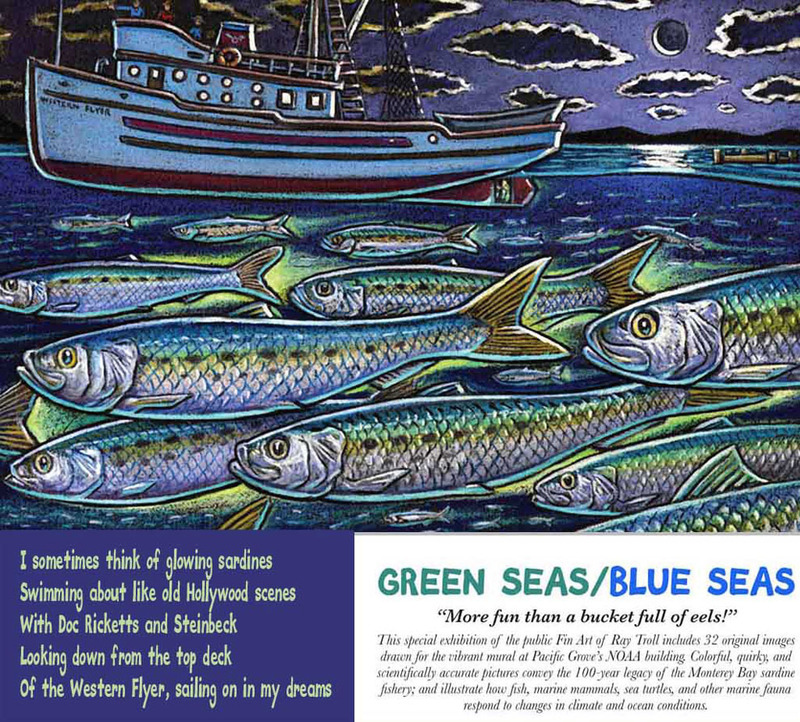 The faculty from the University of Washington’s School of Aquatic and Fishery Sciences (SAFS) department commissioned this painting. The original is 7 by 15 feet, acrylic on canvas and took me about a year to paint. It’s hanging prominently on the wall at the SAFS building. What is the Salish Sea? Here’s what Wikepedia has to say: The name Salish Sea was coined only in the late 20th century, and was officially recognized by the United States in 2009 and by Canada in 2010, to describe the coastal waterways surrounding southern Vancouver Island and Puget Sound between Canada and the United States of America. Its major bodies of water are Puget Sound, the Strait of Georgia and the Strait of Juan de Fuca. 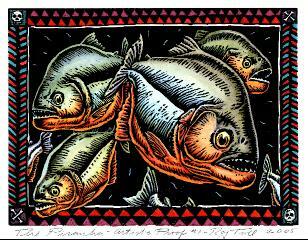 There are about 100 species of fish depicted along with the Seattle skyline, Mt. Rainier, a pencil, a paintbrush, a slice of pizza, the Edgewater Hotel, the Kalakala ferry, and Professor Trevor Kincaid. 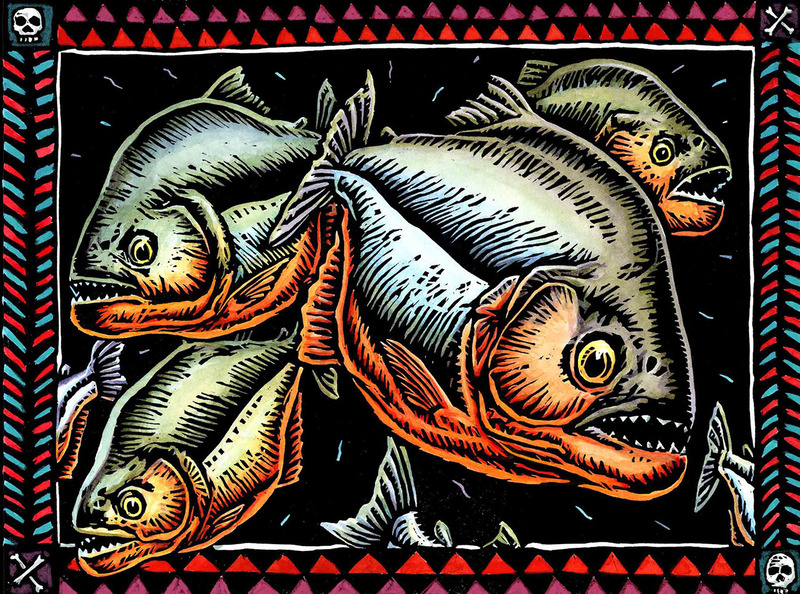 You can get signed art posters of this insanely detailed fish-filled image in our web store by clicking right here. There’s also a species identification chart posted online if you click right here. 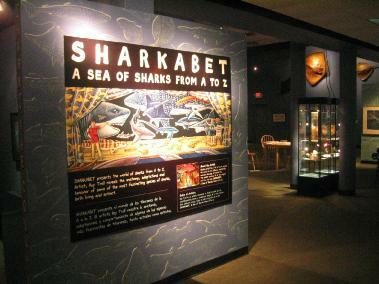 The Miami Museum of Science is showing images from my Sharkabet Book.